sailboat. : Monday Lust List 008. The Peter Pan smock dress is gorgeous, but Topshop is so so expensive! I'm convinced they've raised their prices even higher actually. It is really pretty though hmmm..I think it'd look lovely in black too, or maybe even a deep red. Oh how I love "Arthur the Bunny Ring" as he shall now henceforth be known!! Second time trying to post this comment. I got so excited the first time, I typed too fast and managed to crash my computer! :P hehe. Why is Topshop so expensive?! Ooh that ring is perfect for you and the hedgehog jumper is super cute! Animal related fashion always gets my vote! I love the bag and i'm actually on the hunt for a peter pan collar dress to wear under my knitted jumpers this winter, but that one's a little out of my price range atm! 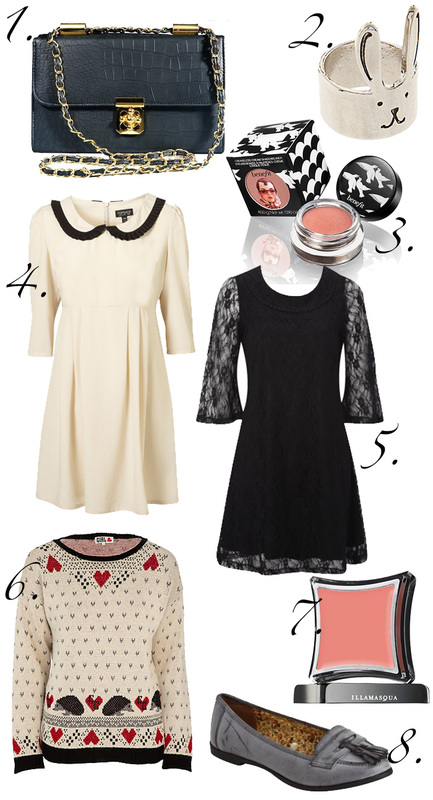 I just posted a River Island inspired wishlist if you want to take a gander! I love you lust lists! :) the dresses are super cute! That bunny ring!!!! Aaah I love it. The matalan loafers look great too! love Love LOVE everything! Need some cute knits like this! Ahhhh the Topshop dress is a beauty, just a shame about the price like you said! Everywhere seems to have really cute jumpers at the moment, this River Island one is adorable! Top Shop has a really cute rabbit right now too. Awww! animal rings always steal my heart, it's so much more interesting than a plain band or gem, still, I like a bit of variety! Oh the black dress is lush soooo pretty! I wish that Topshop wasn't so expensive too but everything is so pretty! The lace dress and the bag are gorgeous. Think I'm going through a bit of a bag phase at the moment! Topshop is so expensive. Its ridiculous. I work in retail and some of our basic stock ie scallop tops is exactly the same but a third of the price. Its the same supplier, the only difference is the label that is inside. I don't know how many times we have had stock come in with topshp hangers.